Home » Business and Entrepreneurship » Is It a Business Opportunity or a Scam? As a freshman in college, I saw an ad in the school newspaper looking for envelope stuffers. To me, the idea of stuffing envelopes at a rate of $1 per envelope seemed like a great “business opportunity.” I had a scholarship, and I was working at the university cafeteria for spending money. When I saw that ad, though, I pictured myself quitting the cafeteria job and spending one hour a day working for $60. All I had to do was send $1 to an address, and I’d be provided with the business kit. I was 18 and excited at the prospect of untold riches. I sent in the $1. Imagine my surprise when all I received in return was single sheet of paper explaining that I should photocopy it, put an ad in the local newspaper or on a community bulletin board, and then mail it to those who sent in asking for the “business kit.” I felt foolish as I sat in my dorm room, perusing what I received, and realizing that I’d been had. It’s a good thing I was at least smart enough not to quit my cafeteria job until I could see how my “business opportunity” would pan out. Since my freshman year in college, things have changed quite a bit. Laptops and tablets are standard on college campuses, and almost everyone has the Internet. More than ever, it’s possible to earn money in your free time with a home business or side hustle. Promise of easy money: This is perhaps the oldest sign of a scam in the book. I fell for it at 18, and thousands of people fall for it every day. The idea is that you can do easy work for a good sum of money. Or, you pay a reasonable sounding amount of money for a system or kit that is supposed to do most of the work for you. The unfortunate reality is that you need to put in time and effort to make any business succeed. While it’s possible to ease off later on, if you’ve built up your business right, at the beginning any venture requires effort. Pressure to make a fast decision: While you don’t run into the pressure to make an immediate decision all the time, one of the signs that you are dealing with someone unscrupulous is that they tell you that you have to decide right now if you want in. You have to buy a bunch of inventory immediately in order to fast track yourself. If you are receiving pressure to commit now, and discouraged to go home, talk to your life partner, and sleep on it, you could be dealing with a scam. You have to front money to get started: When you start your own legitimate business, especially one that involves selling inventory, you are going to have to put up some money. However, what you have to watch for is when you are asked to put up money to get “special” training, or buy particular materials. If you are asked to pay for a “background check” that is also a red flag that you are dealing with a scammer. Also, be worried about MLM companies that insist that you buy a huge stockpile of inventory up front, especially if you are encouraged to whip out the credit card to pay for your inventory. It’s important to trust your gut anytime you are presented with a “business opportunity.” Before I sent my $1 in for my “business kit,” I had a couple of misgivings. My main thought was how odd it was that they would need human envelope stuffers when machines could do it for much cheaper than $1 apiece. Plus, if I was really honest with myself, I knew, deep down, $60 an hour was a ridiculous amount to earn by sitting in my dorm room stuffing envelopes. What do you think? What are the biggest tipoffs that something is a scam? Direct Sales: Perfect Job for Stay-At-Home-Moms? I think the first two are correct but the last one I disagree with. Either that or we need to change our definition of what we think a scam is. I also think some people need a proper education on what a scam is. For example, I myself have never worked for the company you mention Vector (Cutco knives)., but have enough friends that have to know about them. Would I work for them myself? No. Would I recommend them for someone needing to make money right away? No. But would I label them a scam because they require you to pay up front for their product that you will be selling without a guarantee to make any money? No. 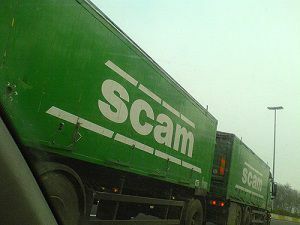 A scam is something that is illegal or illegitimate. You don’t have to pay the money nor do you have to work with them, it’s your choice. But if you choose to pay up front so that you could make some money doesn’t make them a scam. That goes for network marketing companies and MLMs alike. Just because you wouldn’t personally pursue working with a company and don’t believe how they do business doesn’t make them a scam, and the more comments by uninformed people putting the label of scam on every company they see ruins the reputation for a lot of great companies out there with great products and great income potential. The upfront payment is the biggest indicator. People should also be aware of vague job descriptions. When I was in college, I also experienced the knife sales gig. I went to the “job interview” without knowing what kind of job it was. When I was corralled into a room with 20 other people I became suspicious but stayed to hear the pitch anyway. They told us that we had to buy a knife kit of either $250 or $500 and do demonstrations in order to get paid. Ugh! I walked out. That company is still around preying on innocent college students.. It’s called Vector. Stay away. Excellent advice, easy money is a big sign of a scam. Most money takes hard work to achieve, although that’s not to say that once you’ve established your business you can’t turn it into a profitable enterprise with less effort, but starting out is always difficult. When I was in college it was the “Make $13.00 an hour selling knives” scam. Luckily I had enough sense to realize the only person making money was the one sticking these signs up all over campus! Wow, I’ve long wondered about that envelope-stuffing ‘business opportunity’–thanks for sharing your story! I think your “easy money” promise is probably the biggest tip-off. If these were legit, none of us would be working for a living, right? It also seems most of the ‘front men’ (and they are usually male) for scams are the loud, aggressive, in-your-face types. Also many of the sales pitches include a not-so-subtle implication that you’re just stupid if you don’t buy whatever the pitchman is selling.